Radio and Television personality who is also a tourism expert, Gilbert Abeiku Aggrey popularly known as Abeiku Santana of Okay FM and renowned Multimedia’s Afia Pokua, also known as Vim Lady won the Excellence in Media category at the 2019 edition of Gold Coast Excellence Awards. 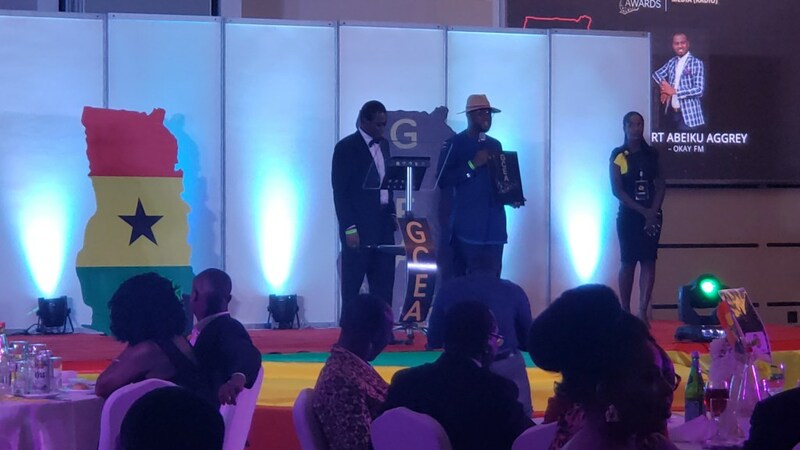 The Gold Coast Excellence Awards honoured over forty personalities and companies in Ghana, featuring industries like Architecture, Banking, Pharmaceuticals, Automobiles, Sports and others. Abeiku Santana won for the radio category and Afia Pokua received the TV category. In appreciation, Abeiku Santana said that he wasn’t expecting to win because the category was made up of high presenters in the media but quickly retorted that he has also paid his dues with 22 years experience and hard work. He thanked the organized for recognizing his efforts and impact on the media space. Being a tourism and hospitality Ambassador, Abeiku Santana said that media practitioners can develop, unite and extend their brand lives which is his motivation to move tourism from Ghana to the world. In a separate chat with Attractivemustapha.com, he used the opportunity to encourage his friends in the media that they can be a presenter and still be a brand to any creative arts, social science or social marketing. Afia pokua on the other hand dedicated her award to her boss Mr. Kwasi Twum who doubles as the Founder, Chief Executive Officer and Director of Multimedia Group Limited. “This award should goe to my boss Kwasi Twum, I am a very stubborn woman who states my view anytime I feel like and speak out but my Boss Kwasi Twum is one of the few people who always stands by me because he believes I have the talent “, the Vim Lady said.